Another gun is off of Uptown’s streets after a police surveillance mission found an accused cocaine dealer with a handgun in Clarendon Park on Saturday evening. Officers were covertly monitoring a group of ten Conservative Vice Lords in the park around 7 p.m. when 18-year-old Shannon Moore stepped behind a planter and stuffed an object into his waistband, police said. 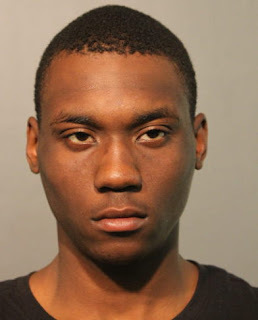 Moore fled when cops approached, but he was quickly apprehended and a handgun with an extended magazine containing 20 live rounds was found in his waist, prosecutors say. The gun was reported stolen on April 29 in Marion, IL, investigators said. At the time of his arrest on Saturday, Moore was out on bail after being smacked with a Class X felony charge of manufacture-delivery of cocaine in the 4500 block of North Sheridan on August 9. He has now picked up new charges of aggravated unlawful use of a loaded firearm; resisting police; and violation of Class X bail bond. Officers say Moore told him that he had the gun “for protection to go home with” and that he had found it under a garbage can. Bail for Moore, who lives in Edgewater, is now set at $350,000.